Europe’s economy has barely grown since the financial crisis broke in 2007. And unemployment, especially among the young, has soared in most countries. Eastern and Southern Europe, the least affluent regions, have suffered the most. Today, in the most affected countries, around one in two young adults seeking a job is not able to find one. If there is one recipe for social and political trouble in the years ahead, this is surely it. To solve this, growth is needed. But higher growth may also lead to more emissions of greenhouse gases, deepening the climate crisis with disturbing long-run consequences, both economically and socially. There is a simple equation which illustrates this tradeoff. Growth of greenhouse gases emissions (g) is the sum of economic growth (y) and growth in the greenhouse-gas intensity (i): g = y + i. The greenhouse-gas intensity reflects how capable the economy of a country is in generating income without harming the climate. For a given greenhouse-gas intensity, there is a one-to-one tradeoff between emissions of greenhouse gases and economic growth: increased growth in order to reduce unemployment will therefore bring further harm to the climate. But the greenhouse-gas intensity is not constant. As a result of technological progress and changes in consumption patterns, most advanced economies emit less greenhouse gases per unit of GDP than they did some years ago. In Europe the intensity has declined by about 2% a year on average since 2000. Until the financial crisis struck, Europe’s GDP grew at about the same rate, so Europe’s total emission of greenhouse gases was roughly constant for a number of years. Since then, Europe’s economy has hardly grown at all, while the greenhouse-gas intensity has continued to decline, leading to reduced emissions. The problem is that if the economy starts to grow again at the same rate as before the crisis, the decline in emission of greenhouse-gases will most likely come to a halt. Europe’s politicians pride themselves for being at the forefront in confronting the climate crisis. There was indeed some reduction in emissions in the early 1990s, mainly caused by the closure of polluting activities in former socialist countries in the East. But this tendency did not extend to the rest of Europe, nor did it apply in the years that followed (at least until the financial crisis struck). The goal that Europe’s politicians have announced for 2030 – a 40% reduction in emissions compared to the 1990 level – may not appear very bold. Indeed, more than half of that has been achieved already, to a large extent as a result of economic stagnation. However, the goals of a 60% reduction in greenhouse gas emissions by 2040, and a 80% reduction or more ten years later, are much more demanding. To meet these, green-house gas intensity has to decline much faster than it has done historically. For example, GDP growth in Europe of around 2% per year (which is relatively low by historical standards), would require at least a tripling in the annual reduction in climate gas intensity from 2030 onwards in order to reach the target. How to bring about a radical transformation of this order is clearly a crucial question. If the economy starts to grow again at the same rate as before the crisis, the decline in emission of greenhouse-gases will most likely come to a halt. Arguably, if these ambitious long-run targets are to be met, it is not sensible to postpone the necessary changes until later, which is what European politicians, in spite of their rhetoric, seem inclined to. Doing a lot in a very short time later on will clearly be much more demanding (and perhaps not realistic). Thus, to reach the stated goals, the transformation to sustainability has to start at full speed right now. A range of different technologies, organizational arrangements and policies will be necessary, since there is no simple fix or solution. For example, putting a price on emissions will surely be necessary but not sufficient, and is very challenging to implement and mobilize support for (as the failure hitherto of EU’s trading scheme for greenhouse gas emissions, the ETS, clearly shows). Moreover, the necessary technological and organizational solutions for the transition to sustainability will have to be developed in time. Such systems often need several decades to reach the required level of efficiency, pointing to the urgency of the challenge. To succeed, innovation on an enormous scale will be required, and innovation policy will therefore have to be central in the overall policy mix. The extensive changes in transport, energy provision and use, heating, infrastructure and so on that the transformation requires will also require huge investments and innovative policies for mobilizing the necessary capital. One of the biggest challenges facing politicians today is to make investments in the transition attractive to investment funds and other actors in the capital market (which is currently brimming with funds in search of profitable investment opportunities). What about the unemployed in the East and South of Europe? They will also gain from speeding up the transformation to sustainability, as the necessary investments in new solutions (and the required infrastructure) are bound to create considerable new employment. Moreover, the poorest parts of Europe, in the East and to some extent the South, emit far more greenhouse gases per unit of GDP than richer members of the union, and hence are more in need of such transformative investments. A European programme for sustainable growth, giving priority to the parts of Europe where the transition is most needed, can be a real game changer. Headline Image credit: Industrielandschaft by dé.wé. CC BY-SA 2.0 via Flickr. Jan Fagerberg is professor at the University of Oslo, where he is affiliated with the Centre for Technology, Innovation and Culture, and at Ålborg University. 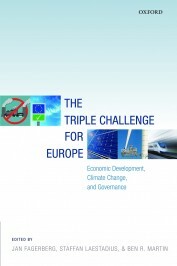 He is the author of The Triple Challenge for Europe: Economic Development, Climate Change, and Governance (OUP 2015) along with authors Staffan Laestadius who is professor emeritus of Industrial Dynamics at Kungliga Tekniska Högskolan, KTH (Royal Instutute of Technology) in Stockholm, Sweden and Ben Martin who is Professor of Science and Technology Policy Studies in SPRU, University of Sussex.